Our guests today were: Roseville Rotarian Marv Sorvala and Past District Governor Kyle Haugen. PDG Haugen took the floor to present a Rotary Citation to Immediate Past-President Gerry Tietz. The Rotary Citation acknowledges clubs that set and achieved significant goals and was awarded to only 12 other clubs in the district. Gerry thanked all who helped make the citation possible and asked last year’s Board to join him for a photo, below. Cindy Carlson noted that Ralph Reeder Food Shelf needs volunteers to help pack Thanksgiving meals for food shelf clients. We hope you can join us on Tuesday, November 20th from 9:30-11:00. Their new address is 2544 Mounds View Boulevard (formerly County Hwy 10), Mounds View, MN 55112 in the Silver View Plaza strip mall. Cindy also said that the grant request for our Harvest Pack Event on December 11th is ready to be submitted to the District Grants Subcommittee. The event will be a cooperative effort of the Eagles, Lions, Rotary and Irondale students and we expect it to be twice as big as our last packing event. Mark your calendars on Saturday, February 23 for the celebration of our 40th Anniversary as a Rotary Club. We’d like to include as many previous Rotarians as possible so be thinking about whom you could contact to join in the celebration. John Ordway read a note from PeaceMaker Minnesota thanking us for our recent contribution of $250 as well as all the other contributions we have made over the past nine years. Charlie Longbella has been approved for club membership. Be sure to take the opportunity to welcome him into the club. Most of you will remember Jed Hamoud, a frequent presenter at our club regarding Kids Alive International. Jed intends to join the club in the next few months. - Jeff Benson offered a dollar in gratitude for keeping control of his car after hitting a deer at 70 mph last Friday. - Jeff also gave a buck for Dave Hoel who was happy to be a head election judge today and thus unable to be at Rotary. 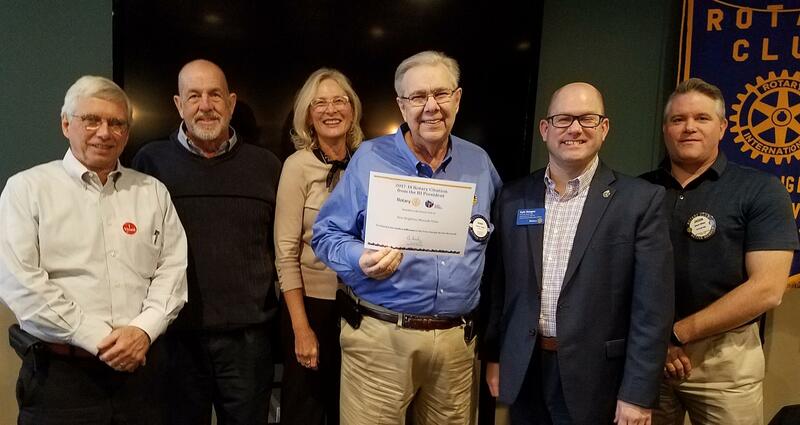 - Mike Neeley offered a buck on the occasion of his 47 years in Rotary, all of it with perfect attendance. 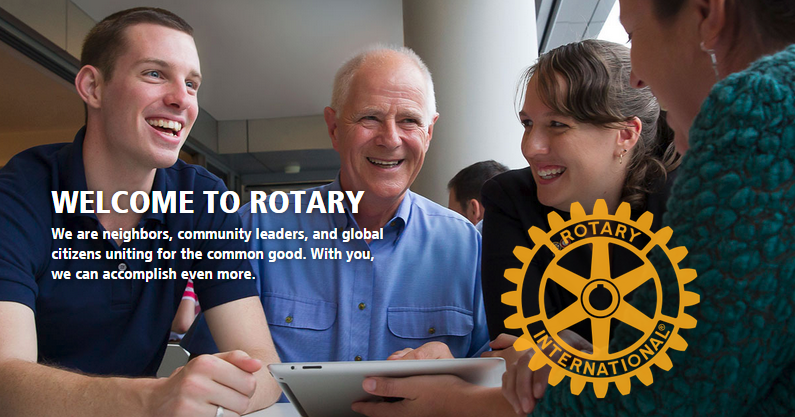 Mike summarized some of the many ways Rotary has changed since he joined way back in1971. 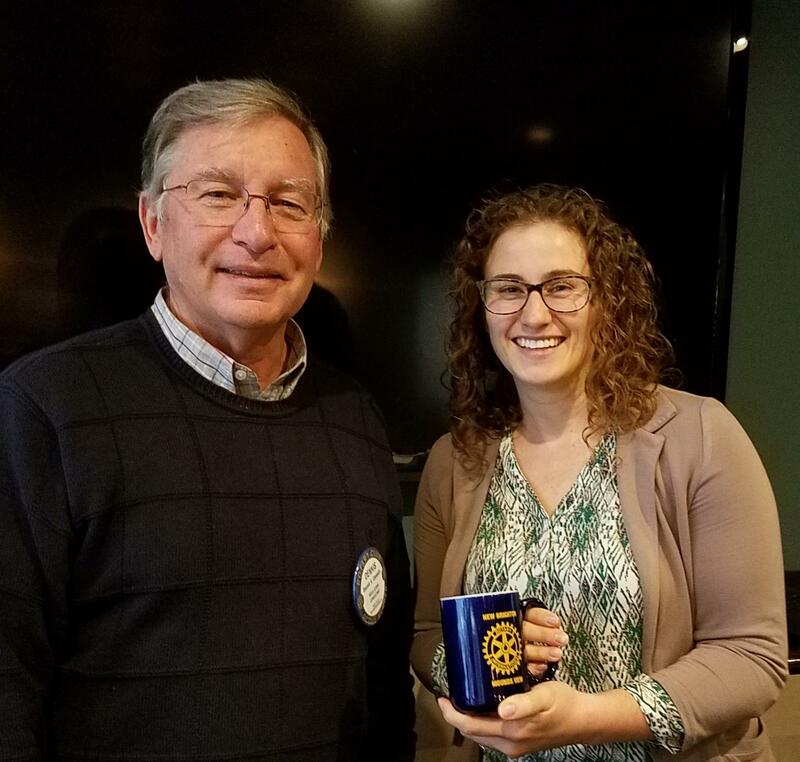 - Gerry Tietz was happy for the club, upon receiving the Rotary Citation. - Paul Fournier was happy to recognize the 71st anniversary of the one and only flight of Howard Hughes’ Spruce Goose. Paul made regular trips to maintain the propellers of the big bird in case it should ever fly again. - John Marg Patton travelled to Branson, MO and was very impressed with the Texas Tenors. Dana Rebelein was happy for the Vikes and the Wild and for her chance to see the Gophers hockey team, even though they lost to Minnesota State. Dennis Connolly introduced his Medtronic co-worker and Mano a Mano Board member, Anneli Borst. Anneli’s topic was Mano a Mano International Partners. Mano a Mano’s mission is to create partnerships with impoverished Bolivian communities to improve health and increase economic well-being. Anneli’s involvement with Mano a Mano began when Medtronic supported a project to provide medical supplies to Bolivia. Anneli was drawn to the project because she has family living in Bolivia and she was aware of the shortage of medical supplies there. Mano a Mano was founded in 1994 by Joan and Segundo Velasquez, who began by bringing one suitcase of surplus medical supplies back to Bolivia after a trip to the U.S. Segundo was an airline employee so he could bring back as many pieces of luggage as he wanted, so soon he was bringing back 15 at a time. Soon, they started working with communities to build sustainable medical clinics and now there are 165 clinics serving 800,000 poor Bolivians. The new clinics led to housing for doctors and staff, road construction, water wells and reservoirs, agricultural classes, schools and aviation medical care. All of these initiatives are based on an integrated approach, involving the communities in decisions and maintenance to improve sustainability. All of these improvements have been accomplished despite Mano a Mano’s steadfast refusal to give bribes to officials to get things done. Corruption, cross-cultural issues and government requirements hamper Mano a Mano’s ability to bring change. Lack of U.S. awareness of Bolivia’s plight has also been a challenge but more and more organizations, including 20 Rotary clubs (ours included), are seeing the need and responding. Mano a Mano is happy to set up opportunities for groups to sort medical supplies prior to shipping them to Bolivia. For more information about Mano a Mano, click here. Dennis and Anneli are pictured below.